Ok, it's a great jacket with the venting top notch..BUT it really is chilly/windy (needs 3 layers underneath) on the arms and it is sooo awkward to button the neck - such a bad design..and the movable neck button does not stay in place.. Fix this and it is five stars. For this price the quality is excellent. My only complaint is that the size of the shoulder and elbow pads are a bit small, and that there is no back protector, but again, the price is low so these could be upgraded for an even better jacket. I'm 190 cm tall and weigh about 82 kg. Size L fits me perfect with some room to spare for a stand alone back protector for now. Sportbikesshop delivered to me in Sweden in 3 days which is awesome. I bought this jacket on a budget, but so glad I chose this one. It keeps me warm and dry in heavy rain. Highly recommend. I knew this brand for a long time. I measure 1.83, 80kg and I ordered a size L, I'm perfect. It is noted that it is of good quality and has very good details, such as the ventilation zippers two on the chest, two behind on the back and two more on the sleeves for those hot days. Now here we are in winter and the truth is that without the thermal lining put is great and nothing cold happened and with rain does not enter any water. Buy the green one and it's beautiful. The relationship with the excellent store and the shipping has been very fast. I will buy here again. I was skeptical about buying a jacket from the Internet as measurements can be subjective and I am at Spain at the moment.The product range offered by local shops is limited at best where I live. SBS offers free shipping which was extremely fast and efficient as always. I used the measurement guide provided by the Oxford website and it was a perfect fit. I was very happily surprised. The jacket itself is very well made. Offers night visibility and already has proved itself in heavy rain days and extremely hot sunny days. 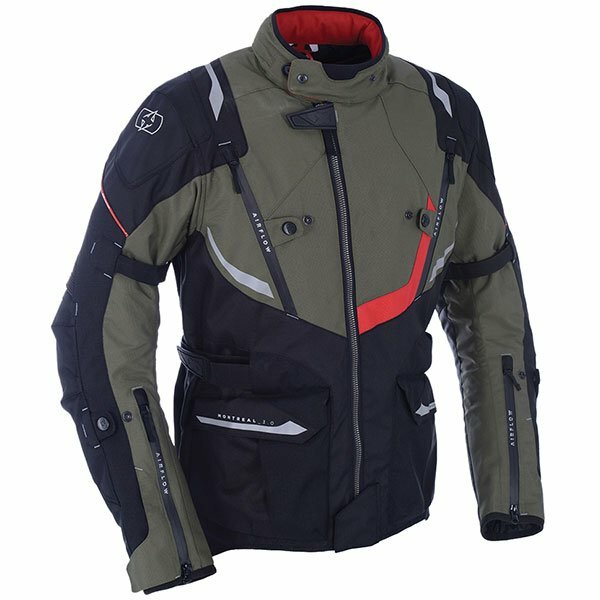 Multiple pockets, shoulder and elbow protection included. Ventilation sockets, inner removable lining and double zipper. I have not owned many motorcycle jackets but this is my new favorite daily go-to jacket. Many thanks guys. Looks good and has plenty of venting, not used in the rain yet but seems well put together so should be OK.
Have bought a few items from this company, and always very competitive with great choice of colours and sizes. Always communicate well with regards to delivery options as well. We would recommend the Oxford RB-Pi2 Back Protector Insert Quick find: 394098 for your jacket.